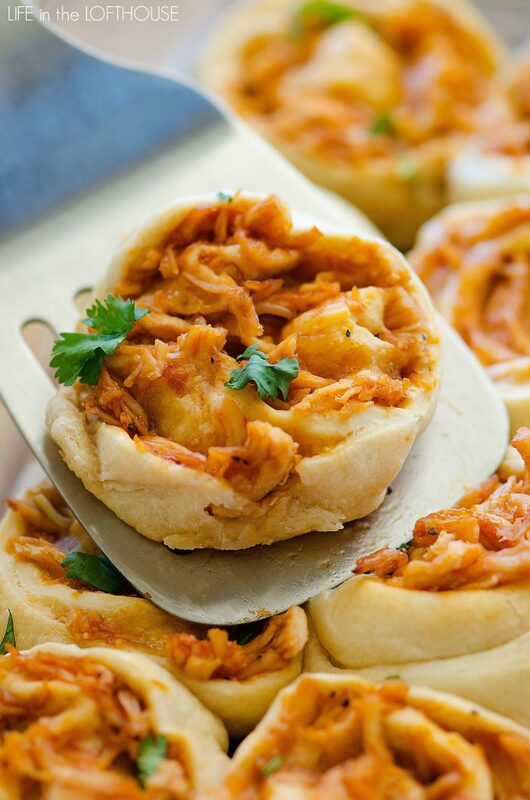 Delicious shredded BBQ Chicken and Colby-Jack cheese are rolled up in pizza dough then baked to perfection. These BBQ Chicken Rollups would make for a yummy dinner or appetizer! The other night I was getting ready to make our fave BBQ Chicken Pizza for dinner when I realized I was out of yeast. So there went the plans of making our homemade pizza dough. Luckily, I had a tube of crescent rolls sitting in the fridge, so I created these BBQ Chicken Rollups instead! 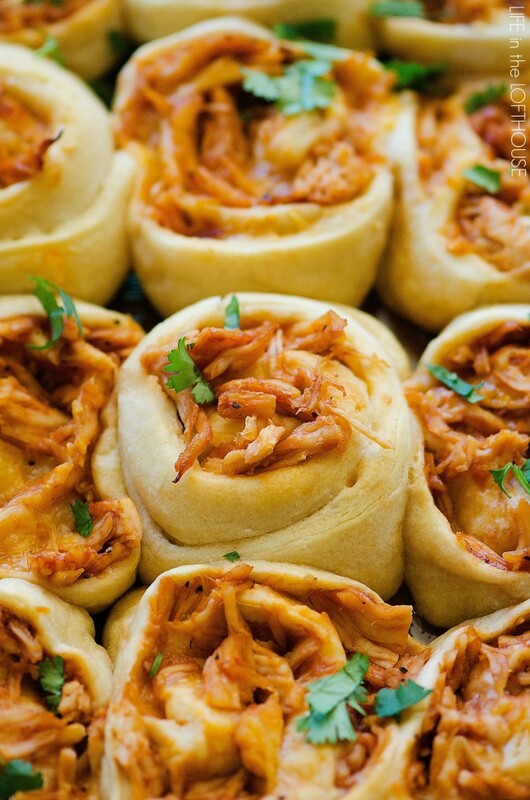 Delicious BBQ chicken and cheese rolled up in pizza dough then baked to perfection. 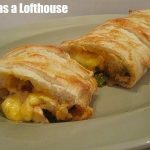 These rollups make for a yummy dinner or appetizer! Preheat oven to 375° F. Grease a 9x13 inch baking pan with non-stick spray. 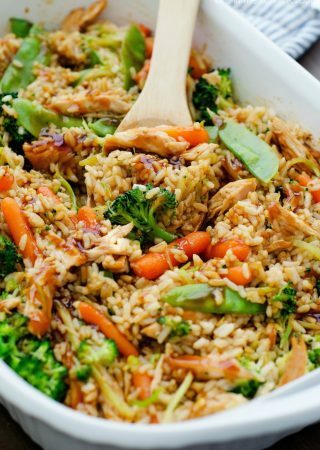 Place cooked, shredded chicken in a medium bowl. Add barbecue sauce and stir to combine. Set aside. Unroll crescent dough from tube. Place dough on wax or parchment paper. Roll out into a 12x15 inch rectangle. Place shredded chicken evenly over dough. Top chicken evenly with shredded cheese. Roll up tightly, like you would a cinnamon roll. Rolling up from longer end. Cut roll into 12 equal pieces. Place in the prepared baking pan. Bake rolls, uncovered, for 22 to 25 minutes, or until golden brown and dough is cooked through. Remove from oven and let stand 5 minutes before serving. Serve with chopped, fresh cilantro, if desired. This recipe sounds so good! Kind of a silly question, but…you say to use cooked chicken. 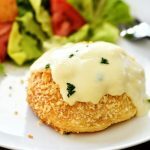 What’s the best/fastest way to cook chicken breasts for a recipe like this? A friend once taught me that you can stick chicken breasts (nothing else, just some salt and pepper if you want!) in the crock pot on HIGH for 3-4 hours. They are perfectly soft and moist every time! Then a quick way to shred the chicken is to throw it in a KitchenAid mixer with the paddle attachment for 20-30 seconds. It comes out just the same as if you just spent 15 minutes pulling it with forks! Love this recipe & love Holly and the Lofthouse blog! I’ve made this recipe several times, it’s a real crowd-pleaser. I use a supermarket rottiserie chicken and decent quality pizza dough from the deli section of the supermarket, and add a little chopped red onion to the chicken / barbecue combo. 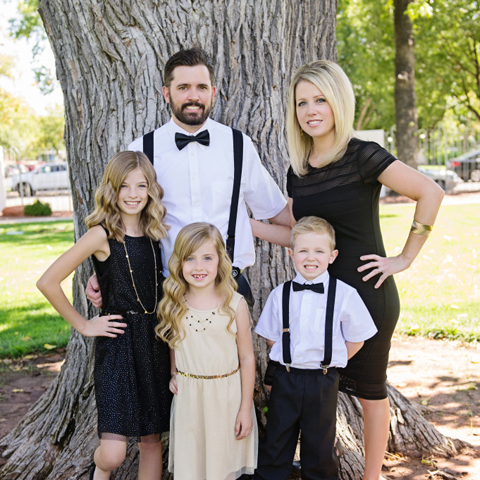 It’s become a family favorite. Thank You, Holly! Do you think I could prepare this in the morning and it keep in I fridge until baking in the evening? Sorry Beth, just now seeing your comment. 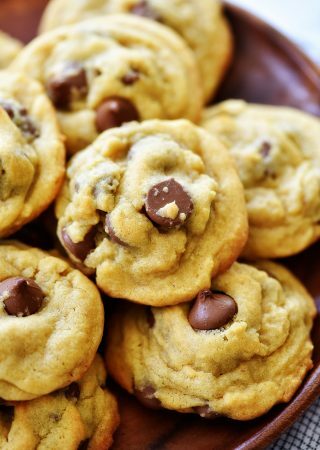 I would recommend making these as soon as you’re ready to bake them. I don’t know how the dough would handle being in the fridge all day. If you do try it, please let me know how it turned out. Thanks!